Replacing the Brake Pads at the right time on your Mercedes Benz is one of the most important jobs to have done for both safety and functionality. From decades of driving on the unpredictable roads here in Alberta... we can guarantee that! Generally speaking, you should have your Brake Pads inspected about every 10,000 miles, and definitely have them replaced if the material lining of the brake pad is worn down so far that it triggers the replacement sensor on your display to go off. In reality, the majority of people do not check their pads very often (if ever), and they usually wait until they see the tiny brake warning lamp appear on the dashboard. It is the best idea to get new Brake Pads and inspect your discs the instant you see that warning lamp light up. If you decide to ignore the warning lamp, you may end up getting to the point of real metal on metal contact - this is where the metal backing of your Brake Pads will be wearing on the brake discs. 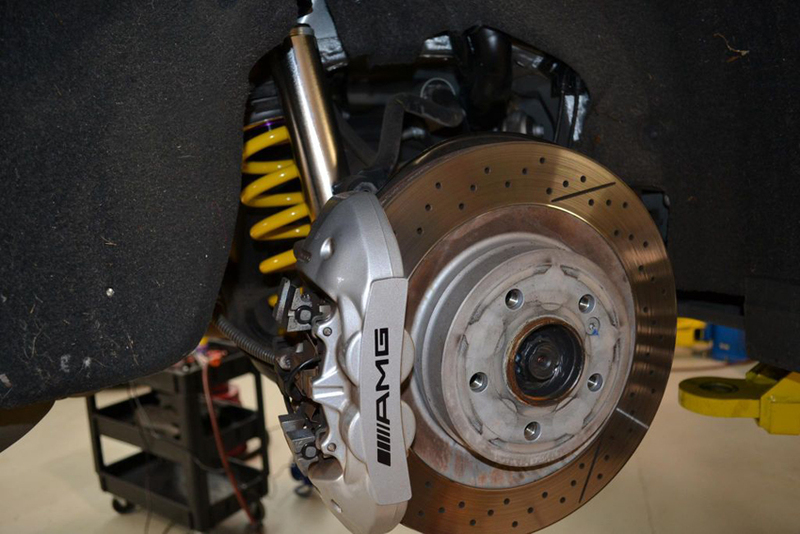 Using the brakes at this time will not only greatly reduce the effectiveness of your Mercedes Benz's braking power, but it will also begin to wear grooves in to your brake discs. After the discs have been grooved, they are absolutely damaged, and there is pretty well no way to repair them properly. Sometimes resurfacing them can work, but too often the groove that has been cut will be much deeper than is allowed by the Mercedes Benz specifications. The smartest thing to do is have your pads replaced by professionals right away. Remember: Your brake pads should only ever be replaced in pairs (i.e. Replace both front pads or both rear pads at a the same time). The same rule applies to the brake discs that should be checked each time your brake pads are replaced. If you have more questions regarding the replacement of your Mercedes brakes in Calgary, Alberta, be sure to contact Euroworks at 403.291.6839 and we'll be sure to assist you in every way we possibly can!